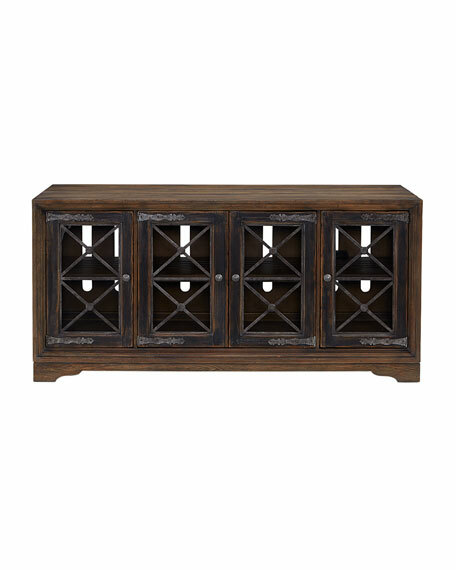 Authentic, rugged with attention to detail are all hallmarks of this versatile "media console". Finished in a timeworn saddle brown tone with heavy distressing and a light dusty wax hang-up for an antique feel, it's highlighted by an anthracite black tone around the door fronts. The hinges are in a pewter finish and designed to emulate saddle straps while the doors have a pewter metal fretwork for added dimension. 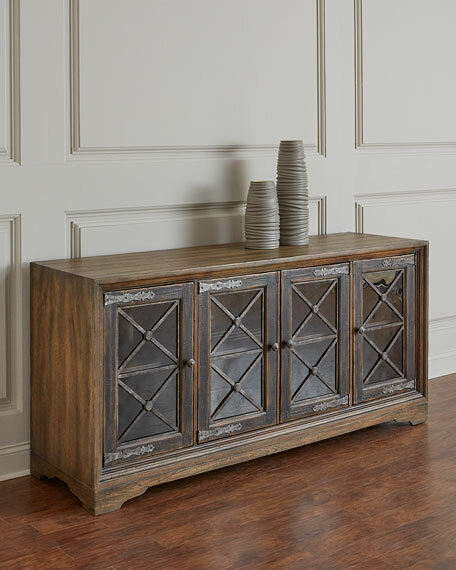 This versatile console could be a dynamic entertainment option but it's equally at home as a companion piece in an office area, as a buffet or as a stunning accent to any room. 76"W x 22"D x 36.3"T.
Hardwood and poplar solids with white oak veneers. Ventilation, wire management and three plug electrical outlets.